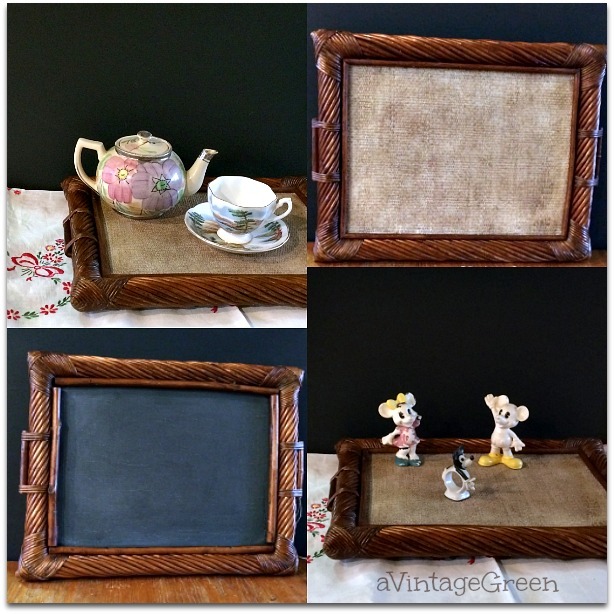 I collect and repurpose thrifted wooden trays and cutting boards (if you are a regular visitor that is no surprise). Below are a few recently finished pieces plus one wicker tray from an earlier post. 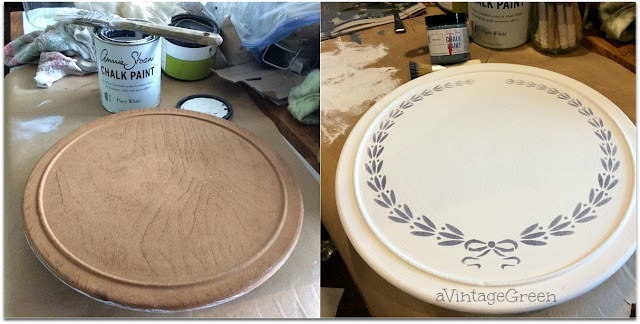 This Lazy Susan tray has been waiting for a couple of years for repurposing. Three coats of ASCP White, CeCe Caldwell Grey for the stenciled wreath plus stenciled Patisserie and the cupcake serving tray is ready. Finished with clear wax and a polish. Found a rather 'loud' patterned cutting board. Stenciled BINGO (stencil from Donna of Funky Junk Interiors) using CeCe Caldwell Beckley Coal with a heavy hand (made sure the black was very black by stenciling over the stenciled letters when they were dry). Finished with hemp oil. Here is one of my favorite tray repurposing projects from earlier this year. A footed wooden cake/cupcake server was painted CeCe Caldwell Simply White and stenciled using Annie Sloan Old Violet. Just in case you want to know - stenciling words on a not so very large round tray with a raised edge is NOT easy. 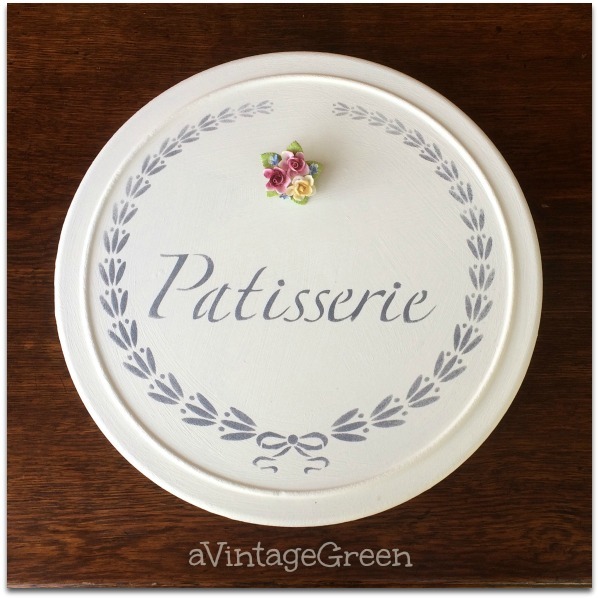 I attempted 2 different regular 12" square French Pastry stencils (chosing just the words I wanted to use) and had to wipe off and repaint the tray surface with CeCe Simply White twice. I could not get the plastic area I needed to be flat enough to stencil properly - not enough fingers to hold the curved plastic flat and I didn't want to cut the plastic stencil into conveniently sized pieces.The repainting certainly slowed down the project. Finally chose a simple design that was on a smaller sized stencil. 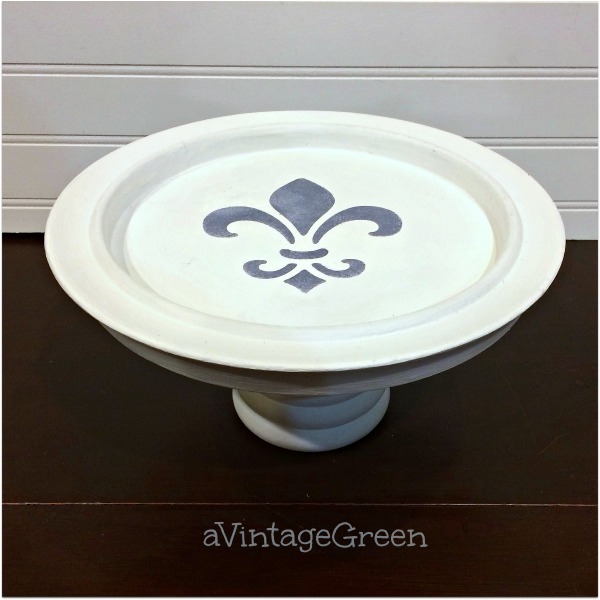 The Fleur de lis is centered on a white cake or cupcake server and finished with clear wax. You are so good at the stenciling and re-purposing. My favorite is the lazy susan! I would so love to have something like that! Hugs! The patisserie one is beautiful and the bingo one os so much fun. So much great inspiration, thanks. A marvelous collection - my favorite is the dark wood with handles. Always love seeing your makeovers, especially the trays. I love what you do with things that others would probably toss. Beautiful work. Lovely, Joy! Thanks for sharing @Vintage Charm--pinned! These all look lovely Joy and especially the lazy-susan. Thanks for sharing your craft ideas with us at #BloggersPitStop. Have a great week! I love all of your ideas! Thanks for sharing at Friday Frenzy Link Party! 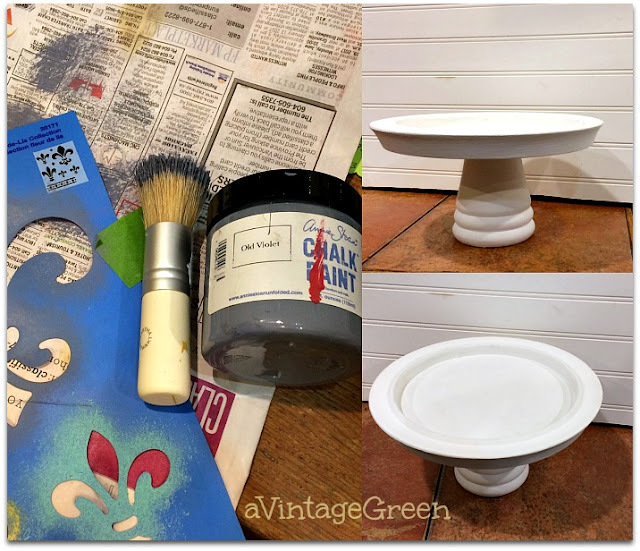 I love repurposing found items! I really need to hit up some thrift stores this weekend. The lazy Susan turned out so cute Joy, and I love the Bingo stencil! Thanks for sharing with SYC. The blue fleur de lys on a white background is a classic décor used by French potters for centuries, I love it. The Bingo cutting board is fab, too. These are super cute! I love the lazy susan and am going to make myself one very soon. Thanks for sharing at the Friday Frenzy Link Party this week! You've given me some fun ideas for upcycling some of my pieces. It is amazing what a little time and paint can do! Joy these are all very well done. I especially love the lazy susan makeover. It would be such a pretty table centerpiece. Its gorgeous. Looks so great. I love a good repurpose!! That cupcake serving tray is so pretty! The before and after is such a difference! 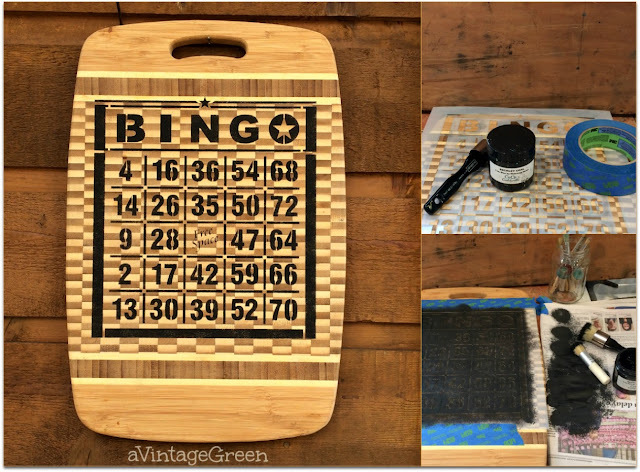 I absolutely love the Bingo cutting board. Thanks for sharing on Sunday's Best.